Minority Rights Group International (MRG) and Ogiek Peoples’ Development Program (OPDP) express their concern about the newly formed Kenyan government Task Force on the implementation of the African Court on Human and Peoples’ Rights judgment regarding the case of the indigenous Ogiek people. In May 2017, the African Court delivered a major victory for the Ogiek, following repeated evictions from their ancestral lands in the Mau Forest, Kenya. In response, the Kenyan government formally gazetted on 10 November 2017 a Task Force on implementing the ruling. However, the government failed to consult with the community, and the Task Force lacks any Ogiek representatives. Under its mandate, the Task Force is required to study the judgment of the African Court and any other local judgments related to the case as well as relevant laws and policies, and to establish the status of the land in question. Importantly, the Task Force is charged with recommending measures to provide redress to the Ogiek, which could include restitution, compensation or the provision of alternative land. The Task Force is also mandated to conduct studies and public awareness on indigenous peoples’ rights. However, in a worrying development, the Ogiek have not been consulted about the Task Force’s establishment, despite several requests to the Attorney-General to participate in a process which directly affects them. While the Task Force ‘may solicit, receive and consider the view of the public and any interest groups’, it regrettably does not require consultation with the Ogiek community, nor does it include Ogiek community members. Instead, the Task Force comprises officials from the Offices of the President and Deputy President, the Ministry of Environment and Natural Resources, the Ministry of Lands and Physical Planning, the National Treasury, the Office of the Attorney General, the Kenya National Human Rights Commission, the National Lands Commission, the Ministry of Sports and Culture, and the Kenya Forest Service. ‘These notable omissions call into question whether meaningful implementation of the African Court’s judgment will take place. The Ogiek see the creation of the Task Force as a positive step, but are obviously concerned that their views may be excluded from this important process. We look forward to active engagement with the Task Force’ adds Daniel Kobei of Ogiek Peoples’ Development Program, who represented the Ogiek throughout the case. The African Court’s decision was a huge step forward for the Ogiek people in recognising their status as an indigenous people and their customary right to land. It also sets an important precedent for indigenous peoples’ rights in Africa and beyond. In addition to declaring that the government had violated the Ogiek’s rights over their ancestral lands due to repeated evictions without consultation or compensation, the African Court ruled that the government had denied their rights to religion, culture and development, whilst also crucially recognizing the role of indigenous peoples in conserving their land and natural resources. The Task Force’s current mandate allows it to operate for a period of six months. 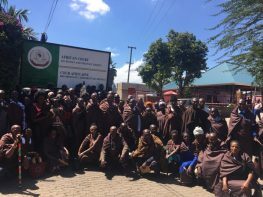 MRG and OPDP look forward to its engagement both with the Ogiek people and the African Court, especially in anticipation of a future ruling on reparations, which is expected to be delivered separately. Minority Rights Group International, Ogiek Peoples’ Development Program and CEMIRIDE were the three original Complainants in the ‘Ogiek case’ before the African Commission. Find out more about the Ogiek on MRG’s legal cases website.